Editor's Note: Ronnie Lott faced John Elway eight times - three times as a member of the 49ers and Raiders, and twice while with the Jets - during his Hall of Fame career. With the exception of San Francisco's win in Super Bowl XXIV, each game was decided by close margins. Lott experienced first-hand three of Elway's famous fourth-quarter magical comebacks. I remember the first time I played you in college. I remember thinking whenever I played you that you were one of the all-time great competitors and one of the all-time great athletes. As we competed in the NFL, I recall that every time I played against you, we could never say the game is over. The reason why was that your athletic skills, your ability to make plays on the run, your ability to be creative, and your ability to believe in yourself. You always thought that you could win the game. And that really elevated other people around you. 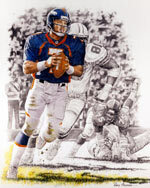 That's what made John Elway great - it wasn't what you did but how you made others rise to the occasion. That's a very difficult task - to have that thought in your mind when playing in a game because I knew that every time I stepped on the field that moment could happen on any given play. But, that's the kind of intensity we had to have and that's the kind of thought process we had when we played against a player of John Elway's caliber. John, I rank you among the greatest quarterbacks of all-time. And, that's because I don't measure quarterbacks on statistics. I measure them based on how they deal with adversity. When I look at your career, the team that surrounded you, and then look at the things you were able to do in the fourth quarter when you created those comebacks, I'd have to say that you're right up there with the likes of Johnny Unitas - who I think is one of the all-time greats - as well as Joe Montana. You three can be measured by an intangible that we don't see in a lot of great quarterbacks. That when you were knocked down, you were still able to dust yourself off, come back and still stick a knife in your opponent! On August 8th when you're inducted into the Hall of Fame in Canton, it will be the ultimate compliment as to who John Elway is. The reason being is that you grew up in the game of football. Your dad was a coach, and because of that you understood the element of what it takes to be great. Your dad talked about it, he cultivated it. It's in your DNA. And so, John, this is the ultimate compliment of being a consummate football player, and the consummate pro athlete. And, I know for you, that yes, going and winning the team accomplishment which is being in the Super Bowl was unbelievable. But when you're bestowed the honor of being elected to the Hall of Fame, you're now in the midst of another team - a team of elite athletes, elite football players. I'm certain that this is going to be remembered as one of the pinnacles of your life because when you were throwing balls back in the valley of California as a young kid, and then going to Stanford, I'm sure in the back of your mind, you wanted to see where you'd end up and how you were going to measured. There's nothing better than standing amongst your peers and seeing their sweat, to see their bones, to see their soul, and to see their heart. And now you will have some of what they all have which is a yellow jacket, the soul of what the Hall of Fame is all about. Now you're a part of a group that allows you to say that - for the rest of your life, for your rest of your kids' lives, and the rest of his kids' kids' life - you were one of the best. John, I'm proud to know that you're a friend, but I'm prouder to know that you're a fellow teammate in the Hall of Fame!